Our Caretakers are here to provide your loved ones with care and support, as if they were a part of our own family. which in fact you are! Our certified staff is more than capable of handling all of your medication needs. You are our primary focus here at Serenity Gardens. Our Caretakers are on the clock 24/7 to give you the care and support your loved ones need. Come and see for yourself schedule a visit now. Schedule a visit to come and see all of our amenities and meet our staff, we are sure that you will want your loved ones to become residents with us. At Serenity Gardens, we set ourselves apart by offering a home-like environment for our memory care residents. We believe that feeling institutionalized at a traditional assisted living facility is what contributes to anxiety, aggression, and other behavioral issues that are common in those who suffer from dementia. To improve the quality of life for our residents and quell the fears of their families, we offer our residents a home, with the added benefit of full-time memory care staff. 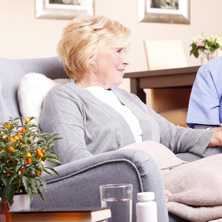 Our memory care assisted living services are provided in a warm, friendly, comfortable and homelike environment. Delicious meals are served in a family dining style, adult-oriented activities are tailored to our residents’ interests and abilities, the laughter of children and stimulating outings round out the living experience at Serenity Gardens. Family support is crucial in the world of dementia care. It is a difficult disease to manage. Memory loss and confusion can be difficult for loved ones to cope with and on bad days, can seem to steal the loved one you know. We are here to assist you and your family through the process. A full-time manager is always available for family discussions regarding life planning for the future. Meal time is family time. 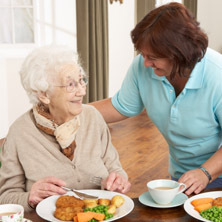 Food is a very important part of our residents’ daily lives. Our team members not only prepare nutritious meals daily, but they also eat and engage in family-style dinners with our residents. At our house, it is Thanksgiving day, every day! Families are always invited to join their loved ones during any meal. The comforting love of children and pets. Residential pets and activities with children are all part of how Serenity Gardens is home. In addition to our home pets, our residents are encouraged to bring their own pet to live with them here at our memory care facility. There is no love that is more comforting than the unconditional love of a pet or child. While providing a comfortable home, we are able to closely monitor your loved one and provide the best quality memory care services. 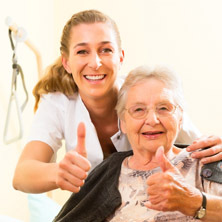 Our medical staff is fully trained and experienced in dealing with chronic disease, assisting with routine activities of daily living, and housekeeping and general maintenance. The reason our residents live with us is for the help we provide when they need it. At Serenity Gardens Memory Care Assisted Living Facility, we offer the families of Friendswood and Dickinson the caring, compassionate, family-style services that everyone deserves. If your loved one suffers from dementia, contact us for the support you and your family need.